Overview Of Battle For Yemen’s Al-Hudaydah On November 16, 2018 (Videos, Photos) 4.25 out of 5 based on 8 ratings. 8 user reviews. Representatives of the Houthis continue released a new statement on the situation in Yemen last night. This time Houthi spokesman Mohammed Abdulsalam said that the Saudi-UAE-led coalition had halted its offensive on the port city of al-Hudaydah. An interestng fact is that Abdulsalam’s remarks go in contrary to the November 15 statement of Brigadier General Yahya Sari, a spokesman of the Yemeni Armed Forces [an ally of the Houthis]. Brigadier General Sari said that despite formal claims the Saudi-UAE-led coalition had not stopped its advance on al-Hudaydah. The abovementioned statements show that the situation in the area of al-Hudaydah still remains tense, even despite the coalition’s inability to deliver a decisive blow to the Houthis there right now. According to local sources, clashes are in fact ongoing east and south of the city. However, no notable attempts of coalition forces to make new advances were reported during the past 48 hours. As the Houthis’ spokesperson noted, the coalition is now concentrating reinfocements and solving its probiems on its supply lines in western Yemen. As soon as the supply lines are defended and fresh reinforcements are deployed, the coalition will likely kick off a new attempt to cpature the city of al-Hudaydah. In turn, the Houthis and their allies urgently have to boost a security zone around the port city. If this is not done, their biggest logistical hub will remain under a constant threat to be captured by the Saudi-UAE-led coalition. The Houthis have to counterattack and dislodge coalition forces from their existing positions, preventing the coalition forces to slowly crawl and reach its objectives in spite of multiple defeats. A more significant attack on their supply lines with the intent of serious cut offs should be considered and executed. I find the reports to be what should be expected. Once supply lines were cut, the offensive dies down as supply problems mount and then reach critical point that halts offensive. The Houthis maintain contact and hostilities to deplete remaining dwindling supplies to force surrender or desertion. This is why sounds of battle continue despite halt to offensive – notice the article states Coalition not trying to take new ground. Note the contact line is in the direct vicinity of Hodeidah unlike in June when it was 5km south of the airport – this is why it was quiet in Hodeidah then relative to current Houthi operation to reduce the pocket and eliminate the force so it cannot threaten in future. The Houthis are claiming Coalition aggression to pre-empt premature cease fire while they degrade the Coalition forces cut off at Hodeidah. Houthis are using the Coalition spin tactics on the Coalition. Meanwhile, as the article states, the Coalition are trying to reestablish supply through a corridor that is completely untenable as the Houthis keep demonstrating. The bulk carrier New Challenge left the Port of Hodeidah yesterday. There is now only one cargo ship – the bulk carrier INCE EVRENYE – left in the port. It has been in port and (I presume) unloading since Nov. 9th. For all practical purposes, the Port is closed. U.S.-backed Saudi/UAE Operation Houthi Famine & bonus cholera epidemic starts again. 5 years from now this time will be seen as the start of Houthi genocide and ethnic cleansing. They are doomed. 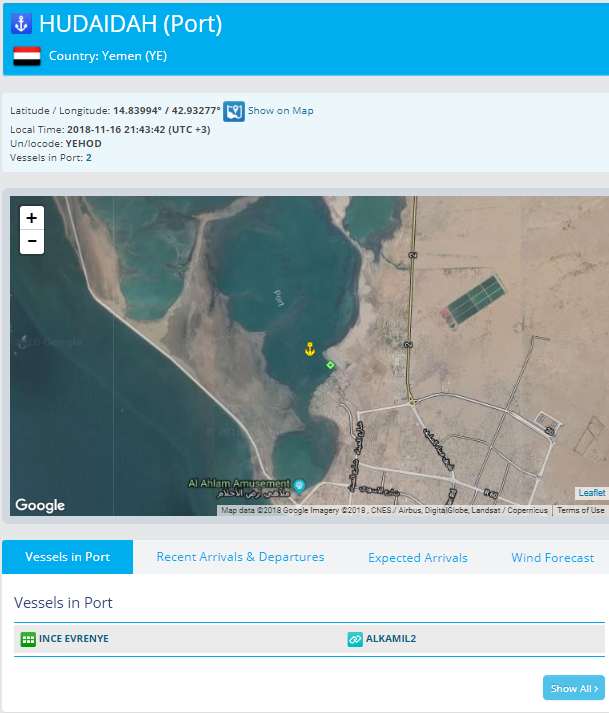 Update: A small oil products tanker – the 9200 DWT ALEJANDRINA 1 – showed up in the Port of Hodeidah this afternoon a long trip from the Port of Fujjairah in the UAE! There are still three much larger oil tankers that have been at the Hodeidah Anchorage for weeks, and three more large oil tankers waiting at the Djibouti Anchorage destined for Hodeidah. All those tankers are probably barred from unloading at Hodeidah due to a Hadi government Economic Committee (bankers) Decree #75, which basically bans sales to the current small importers in the north and only permits sales to big, well-established, Hadi-bankster-approved importers. Bad enough that the Saudis are instrumental in blockading fuel shipments to Hodeidah, but it looks like the UN is helping, too! The United Nations Verification and Inspection Mechanism for Yemen (UNVIM) appears to be helping the Saudis enforce the Decree 75 fuel import restrictions. Since the Houthis do not control the central bank or have access to Yemeni government funds, they have resorted to schemes like funneling all private oil imports through the Yemen Petroleum Company (YPC) terminal, distributing and selling it in the north to generate cash. Looks like the Saudis/UN are willing to cause another cholera epidemic to starve the Houthis of cash. Bankers will end up killing way more people in Yemen than bombs. In fact, they probably already have. FUKUS has a long history of using famine as a weapon against civilian populations. The Bengal Famine of 1943 resulted in 3 million civilians dying due to not being loyal enough to their FUKUS overlords.